A couple of months back, we announced the general availability of App Service on Linux, starting with support for .NET Core, Node.js, Ruby, PHP, and custom Docker containers. Today, we are glad to share the public preview of Java apps on App Service. This release includes built-in support for Apache Tomcat 8.5/9.0 and OpenJDK 8, making it easy for Java developers to deploy web or API apps to Azure. Just bring your .jar or .war file to Azure App Service and we’ll take care of the capacity provisioning, server maintenance, and load balancing. Creating a Java web app is easy with App Service using our out-of-box support for Tomcat and OpenJDK. 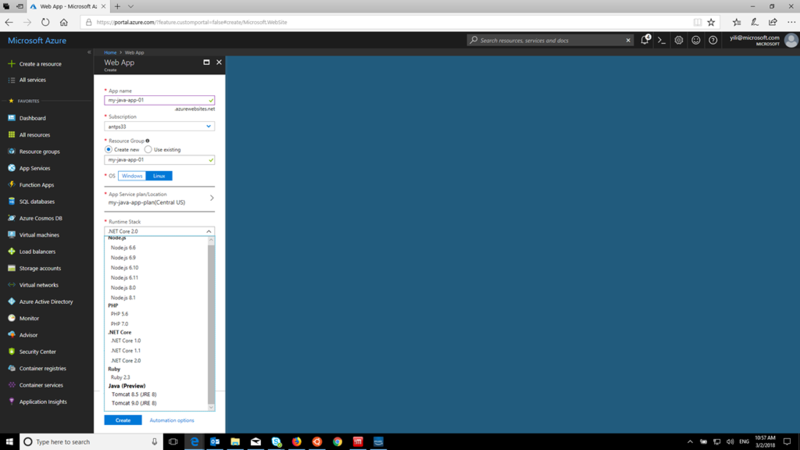 You can deploy your .jar or .war file to Azure and get it up and running at scale with just a few clicks. If you have other preferred images such as Jetty or a different JRE, you can also build your own Docker image and deploy it to App Service. App Service integrates well with your favorite code repos, IDEs, and CLI tools. You can deploy from all the places you would expect including git, GitHub, BitBucket, FTP, among others. You can also build and publish apps and deploy to App Service from your favorite Java IDE using the Azure toolkit for Eclipse or IntelliJ from Windows, macOS, and Linux. Deployments can also be managed via the command line in Linux, macOS, or Windows with the Azure Command Line Interface (CLI). The CLI runs as a client or in a browser via the Azure portal or at shell.azure.com. The CLI is even available in the Azure management app on your iPhone or Android device. Once your Java app is deployed, you can then extend your applications by adding code from the Azure SDK for Java to work with various Azure services such as Storage, MySQL Database, and PostgreSQL Database. You can also get more granular insights into your app by adding agent calls to your application through the Application Insights Java SDK. Looking for manageable identity services? Use the Azure Active Directory Library for Java to plug into identity services that run in 80 percent of the world’s enterprises. These are just a handful examples of SDKs and services available from Azure to boost your productivity and enrich your Java-based web apps. To help you get started, we have dozens of code samples that use the SDK. All of our SDKs run on Windows, macOS, and Linux and are open sourced and available on GitHub. Get started easily with our Java Developer Center. You can also review tutorials and guidance on the Java documentation hub.